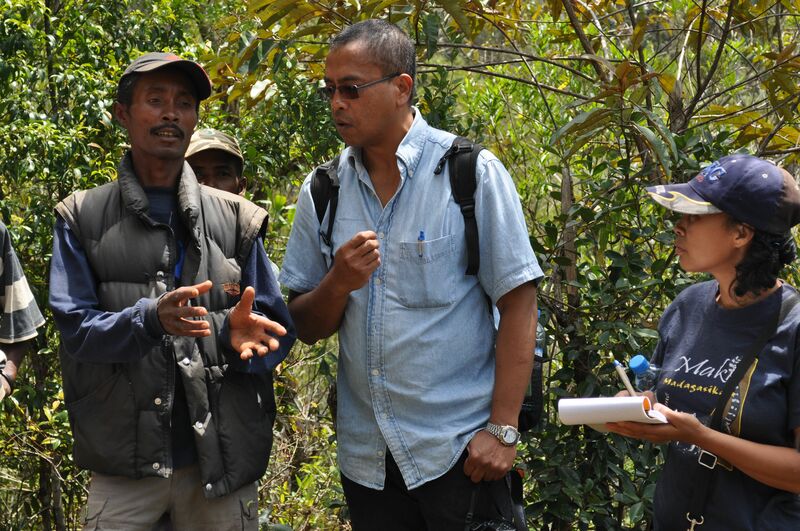 The tantsaha, or farmers, of highland Madagascar lost one of their mo st empathetic interlocutors in late 2015: the geographer Hervé Rakoto Ramiarantsoa. In his books and articles, Hervé investigated the lives and landscapes of rural Imerina, Betsileo, and Tanala country from the farmer’s perspectives. His wonder and respect for the farmer’s techniques, their intricate reworkings of canals, soils, and paddy fields, was as strong as a farmer’s polished wood angady spade. From an anglophone perspective, I would place Hervé’s work at the interface of cultural ecology and political ecology. He sought to understand the detailed functioning of agrarian society, from crop rotations to the kinship of field inheritance to the cultural rituals and language of toponyms. He addressed the dynamic changes and pressures on Malagasy agrarian society, from new markets in eucalyptus charcoal or pineapples, to the colonization of open land and forest, to the local and global politics in biodiversity conservation. His words were always carefully chosen, rich in meaning, and lyrical, as his book titles show – such as when he translated the Malagasy landscape terms nofontany and masondrano into Chair de la terre, œil de l’eau (flesh of the earth, water’s eye) for his 1996 book (which, by the way, received the prestigious Lauréat du Prix TROPIQUES by the Agence Français du Développement). His most recent book, Biodiversités en partage, co-authored with longtime research partner Chantal Blanc-Pamard, was published a year before his death. As I wrote in my book review of this piece, this richly empirical book shows what the nitty-gritty jumble of processes linked to the creation of biodiversity conservation territories (like Ranomafana National Park and the adjacent forest corridor) look like from the perspective of rural residents. They show, through a plethora of examples, how the ‘ecologisation’ of rural development marginalized local people, their livelihood systems, and their knowledge. Current environmental policy results in ‘administered biodiversity’ rather than a ‘shared biodiversity’. This book, like his Chair de la terre (1996) and Le terroir et son double (2000, also with Chantal Blanc-Pamard), appeared in the fantastic series of monographs called À travers champs, edited by Jean Boutrais, focused on the transformations that are being experienced by today’s rural societies and agrarian systems in tropical countries. Hervé grew up in Madagascar, and studied geography to the masters level at the University of Antananarivo in the turbulent 1970s. This was followed by several years studying development geography and soil science in Paris (the old pre-doctoral DEA degree). From 1980 through 1999 he taught at the Ecole Normale Supérieur in Antananarivo. During this time, he completed two theses – his doctorate, defended in 1991 at the Université de Paris X-Nanterre, and his HDR, which opened the door to full professor level, in 1995. In 1999, frustrated with the old guard in Malagasy academia, he successfully qualified for a professorship in France and took a position at Université de Poitiers. Building on his research strengths, from 2007 to 2011 he was seconded to the IRD in Orléans (IRD is a government institution of research for development; he worked in the dynamic GRED group). Most recently, in 2012 Hervé obtained a professorship at the Université de Bordeaux, in a program with a strong tradition in tropical geography. Hervé died suddenly and unexpectedly in September 2015, aged 61. It was an honour to know and work with Hervé. I close with a very appropriate Malagasy proverb used by one of his many dedicated students, Anselme Randriakoto, in a eulogy in the Tribune de Madagascar: Ny hazo no vanon-ko lakana, ao ny ala naniriany (A tree might be used to make a canoe, but it is the forest that grew the tree). Rakoto Ramiarantsoa, H., B. Thibaud, D Peyrusaubes (eds.) (2008) Ruralités Nords-Suds : Inégalités, conflits, innovations. Paris, L’Harmattan. Blanc-Pamard, C., & Rakoto Ramiarantsoa, H. (2000). Le Terroir et son Double: Tsarahonenana 1966-1992, Madagascar. Paris: IRD Editions. Rakoto Ramiarantsoa, H., C. Blanc-Pamard, D. Andriantseheno, H. Ramamonjy (2014) « Des territoires et des contrats au service de l’environnement. Le Lalangina, sur le versant ouest du COFAV (corridor forestier Ambositra Vondrozo) à Madagascar » Cybergeo : European Journal of Geography. Ramamonjisoa, B., Rakoto Ramiarantsoa, H., & Casse, T. (2012). La Loi Gelose et le transfert de gestion des ressources naturelles à Madagascar. Cahiers d’Outre-Mer, 65(257), 5-10 and several other articles in this special issue. Rakoto Ramiarantsoa, H. (1983). Les sols de la plaine d’Ampasimatera. Madagascar Revue de Géographie, 43, 103-123. Rakoto Ramiarantsoa, H. (1982). Développement à contre-sens: Un aménagement hydro-agricole qui n’a pas donné les résultats escomptés. Madagascar Revue de Géographie, 41, 107-120. Peyrusaubes, D., H. Rakoto Ramiaratnsoa, B. Thibaud (2005) « Terres loin du Prince, ou la spatialité différentielle malgache », In Jauze J-M., Guébourg J-L., (coord. ), Inégalité et spatialité dans l’Océan Indien, Paris, L’Harmattan, p. 369-383. Rakoto Ramiarantsoa, H. (2003). Pensée zéro, pensée unique: La < robe des ancêtres > ignorée. In E. Rodary, C. Castellanet, & G. Rossi (Eds. ), Conservation de la nature et développement: L’intégration impossible? (pp. 105-120). Paris: Éditions Karthala et GRET..
C. Blanc-Pamard, H. Rakoto Ramiarantsoa, « Lire la lune. Cours du temps, rythmes climatiques et pratiques agricoles. L’exemple des communautés rurales des Hautes Terres centrales de Madagascar », in Entre ciel et terre, l’homme et le climat. p. 233-252, E. Katz, A. Lammel, M. Goloubinoff (eds. ), IBIS Press et IRD, Paris, 509 p.
Rakoto Ramiarantsoa, H. (1995). Les boisements d’eucalyptus dans l’est de l’Imerina (Madagascar). In C. Blanc-Pamard & L. Cambrézy (Eds. ), Terre, Terroir, Territoire: Les Tensions Fonciers (pp. 83-103). Paris: ORSTOM. Blanc-Pamard, C., & Rakoto Ramiarantsoa, H. (1993). Les bas-fonds des hautes terres centrals de Madagascar: construction et gestion paysannes. In M. Raunet (Ed. ), Bas-fonds et Riziculture, pp. 31-47. Montpellier: CIRAD. Rakoto Ramiarantsoa, H. (1989) « Le paysan encadré ? Les pays Merina et Betsileo au cœur des Hautes Terres malgaches » in Tropiques, Lieux et Liens, Florilège offert à Paul Pélissier et Gilles Sautter, p. 215-227, ed. B. Antheaume et al., Paris, ORSTOM. This entry was posted on Wednesday, February 8th, 2017 at 11:08 am and is filed under Book Review, Development, Madagascar, Political ecology, Smallholder farming. You can follow any responses to this entry through the RSS 2.0 feed. You can leave a response, or trackback from your own site. Thanks for the accurate article ! You found the best words to describe not only his job, but his way of thinking/working. A real tribute to Hervé ! Thanks again !